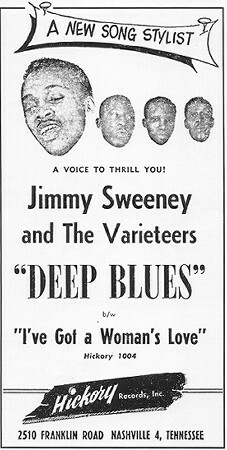 "I've Got A Woman's Love"/"Deep Blues"
Above: March 1954 trade magazine ad acclaiming Jimmy Sweeney as "A New Song Stylist" and "A Voice To Thrill You." Actually, he wasn't really that "new," singing lead in 1947 for The Five Bars on the Bullet label, under his own name on the Tennessee label in 1950, and singing lead for The Varieteers on M-G-M in 1951. 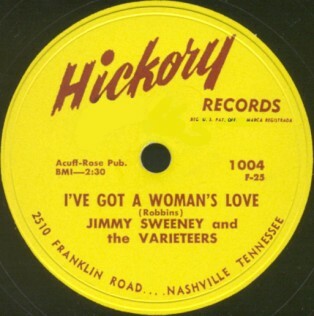 Above: Hickory label image of "I've Got A Woman's Love" released in 1954. Hickory, located in Nashville, specialized more in country and western than rhythm and blues. Click on an option below to listen to "I've Got A Woman's Love" using RealPlayer. Click on an option below to listen to "Deep Blues" using RealPlayer.